Can language bring about environmental change? Poet Gary Snyder shows us that it can. He’s not only important as a writer about environmental issues, but also as a prototype for modern environmental activism. Because he strives with his writing to redefine the ways in which nature is popularly perceived, he is combating the generations of negative thought and action directed toward the environment. By changing the way people think about the natural world, one can also change the way they act. Therefore, by studying Snyder's writing, humans discover a new way of interacting with the environment. 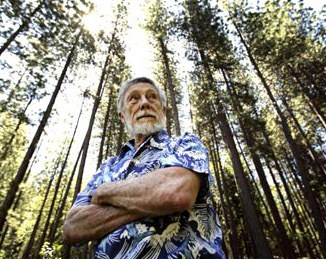 Gary Snyder is both a Buddhist and an environmentalist, and he’s been combining religion and environmentalism in his writing for more than five decades now. Looking at the need to take care of our world through a Buddhist lens isn’t a new concept; for many, the mental states Buddhists wish to achieve (loving kindness, compassion, sympathetic joy and equanimity) only not apply to people, but to all beings on the planet. Because of this, the correlation between Buddhism and environmentalism is a natural one: being unkind to the planet and its inhabitants is contrary to the Buddhist path. Snyder’s consistent combination of the two themes is important to a modern discussion on the environment. In his writing, he has given us the most important tool of all: the language to frame our thoughts and discourse (and from there, our actions) on nature. "Gary Snyder, throughout a long and distinguished career, has been doing what he refers to in one poem as 'the real work.' 'The real work' refers to writing poetry, an unprecedented kind of poetry, in which the most adventurous technique is put at the service of the great themes of nature and love. He has brought together the physical life and the inward life of the spirit to write poetry as solid and yet as constantly changing as the mountains and rivers of his American – and universal – landscape." This quotation is striking in that it hints at the inherent relationship between Snyder's writing and his environmental activism – that one does not exist without the other. Snyder's poetry, religious beliefs, and his activism are then all related. By reading his poems to find ecological significance, one also finds religious meaning. Gary Snyder has a wide, diverse body of work which encompasses a great number of themes, but one that he returns to with especial frequency is that of human relationship with nature. Snyder describes nature as divine, and this goes hand-in-hand with the biocentric nature of his Buddhist beliefs. For Buddhists, seeing the Buddha nature in their surroundings gives the natural world a religious significance. This significance is evident in Snyder’s poems. Eyes open aching from the cold and faced a trout. This poem shows Snyder in the context of the natural world, and the fact that Snyder does not mention his presence until the fifth line of the poem suggests that he is only a small part of the world – not a dominant figure. Nowhere in the poem does Snyder say he has a more important place than any other part of the ecosystem, rather, it suggests that he is an equal. This is demonstrated in the poem's final line, where he ends up face-to-face with a fish. While this may be a description of a literal event, deeper ecological and religious implications are communicated by the way in which Snyder presents it. The world that Snyder describes in the poem is one in which everything has a place and is important, and suggests that human life is equal to all other forms of life. Creating a new pledge of allegiance is a revolutionary act. Snyder takes the focus off national identity and instead put it on nature. While God is mentioned in the original Pledge of Allegiance, Snyder replaces him with the sun. By doing so, he is shifting the focus from an outside deity onto a natural object. Just as God is seen as an important, life-giving power, the sun can also be seen that way – the lives of plants, animals and humans would be impossible without the light the sun provides. By replacing God with the sun, Snyder says that the ecosystem is a complete and sacred entity unto itself. It is also noteworthy that Snyder's new pledge of allegiance makes no specific mention of humans. Humans are implicitly referred to in the line, "and to the beings who thereon dwell," but the poem never raises humans above the other forms of life on Turtle Island. Again, this demonstrates Snyder's belief that humans are only a part of the world, and not necessarily the most important one. the wild in the house. Both together, one big, empty house. The house represents the human habitat, but Snyder places it alone in "the vast wild," which suggests that human civilization is only a small part of the world. Snyder further calls attention to this concept by reiterating and restating it in the next stanza: “the little house in the wild”. Snyder's view of the human relationship with the natural world is very clear in the last line, in which he calls both the little house and nature "one big, empty house". Everything – human homes and nature – make up one big ecosystem, which we all partake of and live in. Snyder's use of the word "wild" gives the word a different meaning, because, although wildness is often associated with evil, "the wild [is] in the house." Humans are not separate from wildness. Instead, they should embrace it. However, Snyder's exploration of the human/nature situation does not end with these sentiments. He goes on to say that the house in the wild and the wild in the house have been forgotten. People have forgotten their inherent connection with nature, and do not see that they are only a part of the ecosystem. He also calls the big house of the ecosystem "empty," which suggests that without the recognition of the connection between humans and nature, the ecosystem is "empty" because it lacks the spirit of coexistence which is necessary for it to be full. – is a snapshot of working alongside an unseen bird. At different tasks in different locations, each is up to the daily work of their lives, neither more important than the other, creating a sense of solidarity and connection?. It’s a small moment about a mundane task. But life is a series of moments like these, and Snyder’s choice to portray a human and woodpecker both at work reinforces the belief in the importance of harmony within a location among the other creatures who live there. These four poems, from different stages in Snyder's career, give a sample of his innovative exploration of humankind’s place in nature. Each poem takes up issues, and together they serve not only as a portrait of one man's views of nature, but also as a foundation for a new way of dealing with the environment. Snyder’s poems go further than merely being about environmentalism or spirituality. They shape our outlook so that it becomes one inherently in harmony with the world around us, providing a template for a new sort of life. Therefore, as formerly suggested, Snyder's poetry is not simply writing about activism, it is activism. In 1990, Gary Snyder published The Practice of the Wild, a book of essays about human relationship with nature. The first essay, "The Etiquette of Freedom", examines the terms we use to describe nature. Snyder spends a great deal of time defining the terms "nature," "wild," and "wilderness". Snyder moves away from the definitions commonly given to these words in contemporary culture, and proposes a new idea: that freedom is inherently connected with wildness, and humans must learn to embrace them together. He poses the question, "Where do we start to resolve the dichotomy of the civilized and the wild?" This question is important to any extended discourse on Snyder's brand of environmentalism, because he believes that for the global environmental crisis to be solved, humans must reconcile the created gap between their culture and wilderness culture. Snyder suggests that the foundations for our present social orders are learned from the order found within nature. Therefore, no matter how much we try to disengage from it, we are connected to nature. In his discussion of language, Snyder says that language is something we learn while living, not while being taught. While schooling can teach us the finer points of language, "the power, the virtu, remains on the side of the wild". In other words, nature is a fine teacher, and the perception of the necessity of separation of civilization and nature is just that – a perception, and nothing more. In this ecumenical spiritual ecology it is suggested that the other animals occupy spiritual as well as 'thermodynamic' niches. Whether or not their consciousness is identical with that of the humans is a moot point. Why should the peculiarities of human consciousness be the standard by which other creatures are judged? Here, Snyder suggests that nature is vast, and by applying human perceptions to other species, humans are limiting the world. Therefore, Snyder argues that humans need to view their relationship with nature in a different way – instead of trying to make it fit preconceived notions of the way things "should" be, we should instead leave nature as it is, and live within it. He also tells us that "home" is as big as we want it to be, and we should stop limiting ourselves to our small definition. This would foster a greater feeling of connection with – rather than isolation from – the natural world. Snyder concludes his essay with a proposal of how humans should live within the world. He says that if we stop fighting nature, "we can accept each other all as barefoot equals sleeping on the same ground". With that, we can return to wildness at its simplest meaning. In order to change the way we act toward nature, we have to change the way we think about it, and Snyder’s reevaluation of the language we use to describe nature is a fundamental step toward that goal. Taking words that commonly have negative connotations and casting them in a positive light is a basic but necessary part of reshaping our approach to nature: it gives us the vocabulary for a positive environmental ethic. This supports the idea that Snyder's use of language is his primary activist tool. By redefining contemporary notions of nature, Snyder is able to propose a new way of living within the world, one in which environmentally sound habits become the obvious way of life. Snyder's career has thus been based on writing about nature in ways which are often foreign to the dominant cultural discourse, and his commitment to this presentation of nature is instrumental in shaping modern environmentalist thought. While much of his writing is not explicitly religious, the connection he has had with Buddhism for the greater part of his life is implicit in all of his work. Although Snyder has been involved in environmental activism in what some may call a more "active" approach, I would like to argue that his body of writing is his most active form of activism. Presenting the issues through writing is important because it gives people the ideas to work from. Without written commentary, "active activism" is not complete. Language can be a revolutionary tool, and writers and their works have been instrumental in shaping society for generations. Gary Snyder's poetry is part of a long tradition of literature as an agent of social change. He’s not only important as a writer about environmental issues, but also as a prototype for modern environmental activism. Because he strives with his writing to redefine the ways in which nature is popularly perceived, he is combating the generations of negative thought and action directed toward the environment. By changing the way people think about the natural world, one can also change the way they act. Therefore, by studying Snyder's writing, humans discover a new way of interacting with the environment. No Responses to "Gary Snyder and Environmental Activism"